Maxima Series L-Shaped grab bars are made of seamless zinc-plated steel pipe, coated with antimicrobial, biocompatible, and warm-to-the-touch vinyl, 15 colors available. MAXIMA Series L-shaped grab bars are made of seamless zinc-plated steel pipe, coated with antimicrobial, biocompatible, and warm-to-the-touch vinyl. 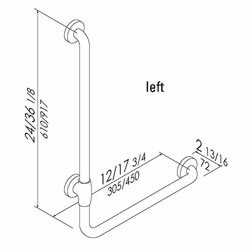 The L-shaped safety supports are all 1-5/16” in diameter and have a clear space of 1-1/2”between wall and bar. They are available in dimensions of 24” x 12” right and left; and 36-1/8” x 17-3/4”right and left. Please allow 1-2 day lead time for White (W1). Please allow 4 to 6 week lead time for all other colors.